I was telling the kids about the days when arcade games were ubiquitous. When we lived in Pine Avenue, Elwood in the early 80s, the local milkbar on Ormond Road had a Donkey Kong Junior machine, for instance. But a short bus ride away in St Kilda was video game heaven. For starters, Luna Park (which in Melbourne was and is free to enter; unlike Sydney, you only pay for the rides), had a shed full of video games next to the Ghost Train. In there I remember pumping my 20 cent coins into machines playing Donkey Kong, Popeye, Frogger, Elevator Action and Space Invaders. The latter was black and white, but with a colour overlay to give it a multi-coloured background. A short walk down Carlisle Street was a laundromat with a Moon Patrol machine. 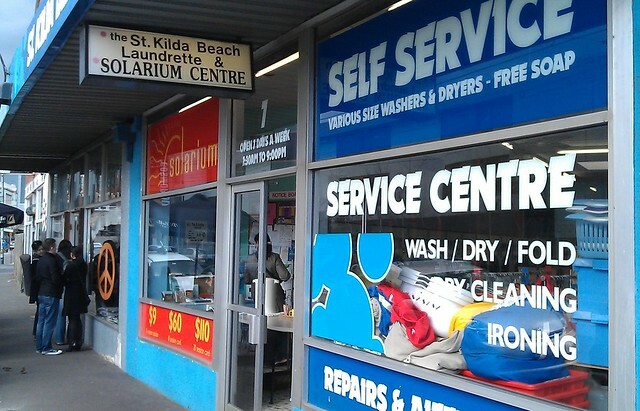 The laundromat is still there, but these days shares the premises with solarium. Sign of the times? Secondly, it was one of the earliest games which would allow you to continue playing after losing all your lives, by putting in another coin. While I wasn’t the world’s best Moon Patrol player by any means, this meant that for 40-60 cents I could play right through the course (which went from A to Z), whereupon it would go back to the start, but with extra difficulty. Great fun. Further down Carlisle Street, at the corner of Barkly Street, was a takeaway place with a Galaga machine. The takeaway place (or its descendant) still appears to be on the same corner. On my trip home from school in year 7 and 8, I’d often change from the tram to the bus at this spot, and play Galaga while I waited. Other highlights around that part of St Kilda for a teenage geek included the computer shop on Barkly Street between which sold clone disk drives for the Commodore 64 (the Skai 64 drive, which I had, but which seems to have virtually faded into obscurity) and the two local newsagents on Acland Street, which sold all my favourite imported computer magazines, such as Commodore User, Compute’s Gazzette, Zzap 64! and later (when I switched allegiences from the Commodore 64 to a BBC Micro) Acorn User and The Micro User. Later when these publications got less mainstream, I ended up having to go into McGills (also now defunct) in the city to get them. Further afield were Timezone in the City (apparently there are still a few of these around) and of course the Fun Factory in South Yarra (likely to be redeveloped in the not-too-distant future), where I sometimes played after school once I’d gone to Melbourne High… not to mention that one year rollerskating (also at the Fun Factory) was offered as a sport. I recall they had Joust, Gauntlet (great with four players), Gyruss and Dragon’s Lair (never my favourite). There was also a place in Balaclava next to the railway bridge which, I recall, was called Sam’s Amusements. Mostly pool tables I think. They may well have had arcade games in there, but it looked way too scary, and I never went in there. You may have worked out by now that I’m enormously nostalgic for the video games of this period. As it turns out, there’s a place in South Melbourne that sells multi-game versions of the old arcade games, in pretty authentic-looking cabinets, and there are others around Australia where you can buy them from about $1200 upwards. One day, maybe. In the mean time, there’s always MAME. Next → Next post: Did some see the London riots coming? I can remember being amazed at seeing a Space Invaders archade-style game (black and white) at Monash Uni in the late ’70s. I assumed this was SOP for Luna parks… was that not the case at some stage for the milsons point one? I spent many a saturday queued up at … can’t remember what time now (8 or 9am) for a 2 hour session at Timezone Swanston Street. Was around $10 and you had 2 hours to play anything you want (they put all the machines on free mode, except for the skill games). @Tango, where’s your local fish’n’chips? The one I used to go to in Murrumbeena 5ish years ago had a machine, but they’ve since got rid of it. Yes, Sydney’s Luna Park used to charge for entry, then the rides were free. They must have changed it sometime in the last few years. @Oz, was that Timezone the underground one near Flinders Lane? I’d forgotten about that one. BTW everybody, what do you reckon’s going on in the right-hand side of the photo from Barkly/Carlisle Sts? Nah it was a little ways up on the way to Bourke Street. Long gone I think. Re. Barkly/Carlisle st photo – given the electrical box doesn’t offer much protection from the other direction – I’d say nothing suss :). 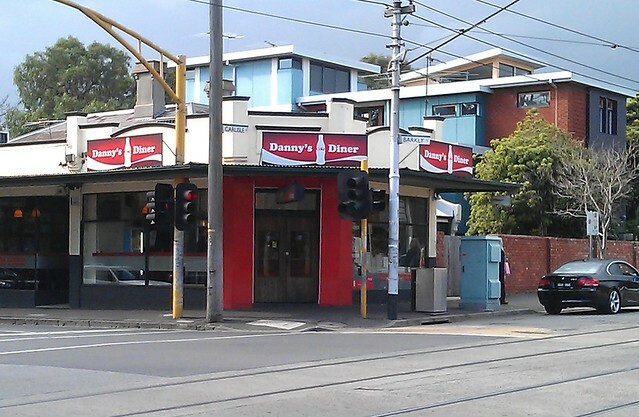 I hope young Daniel didn’t go to the place on the corner of Barkly and Carlisle at night when the ‘ladies’ used to take a break there or sometimes operate from. Was it called Joe’s Burgers? You were right about Sam’s in Balaclava. It was a scary place and dealers used to operate from there and god knows what went on upstairs. I complained to the local police about it and with some agitation, we had it closed down in about ’94 I think. Wish I could remember what went on upstairs, but best for your site that I don’t. I recall the police telling me. I’m sure it had quite a few electronic or older machines inside. Luna Park in Sydney has changed its charging paradigm at least 7 or 8 times in its various failed reincarnations since the 70’s. Ah Moon Patrol… Those were the days! And even though they were crude by today’s standards, as a kid, I was captivated by the old Nintendo hand held sets. Those things could keep you entertained for hours! I remember playing Quix at a table in my local pub, lots of fun and managed to get it in a ROM a few years ago to play again, still had some merit as back then games developers couldn’t rely on fancy graphics but needed good playability. Andrew, I’m so glad we have members of the community with such high moral standards, willing to go to the trouble of getting places they don’t like shut down, someone has to think of the children. Re: Barkly / Carlisle St photo: if the black coupe is parked (as opposed to standing), they’re parked illegally. The reflection in the window shows what appears to be a female, with possibly a bag slung over her shoulder, looking across Carlisle Street. whistfully recalling the Galaga days while wondering where the 16 tram is. Just noticed driver’s side window is down. BTW I spent many an hour in the TimeZone in Bourke Street (promoted as ‘family friendly’ if I recall correctly), and later in the seedier establishments on the W. side of Russell Street b/w Bourke and Little Bourke Streets (would you like some ‘smack’ with your game?). 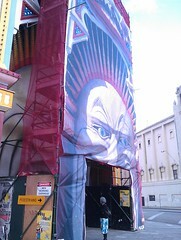 Saw money changing hands over a game over Daytona on Russel St, nothing suss! Also the brothel that had a win a free $%&! with a worker if you beat them at their Sexpo stand. Timezone even had its own magazine for while until Playstation wiped nearly all of them out in the 90s. The Computer and Video Game Museum, 3 Lynch Street, SMYTHESDALE. There is a huge array of computers and video games on display, or to play at the Computer and Video Game Museum. Entrants can learn how Personal Computers changed the world, or just have fun playing Video games from the 70’s to the modern day. You know you’re at the right spot because of the blue-painted Tait carriage and the pair of interlocked gate posts (like the level crossing at Ballarat). Daniel, given your expressed arcade nostalgia, I hope you’ve had the chance to watch the entertaining documentary “King of Kong”. If not, do so soon. Mame, ah yes, she passed away the other day (Lucille Ball) – yes, that’s not the MAME you meant, but it made me think of her. I loved the social aspect of it. I made a lot of friends back in those days just hanging around at those places.